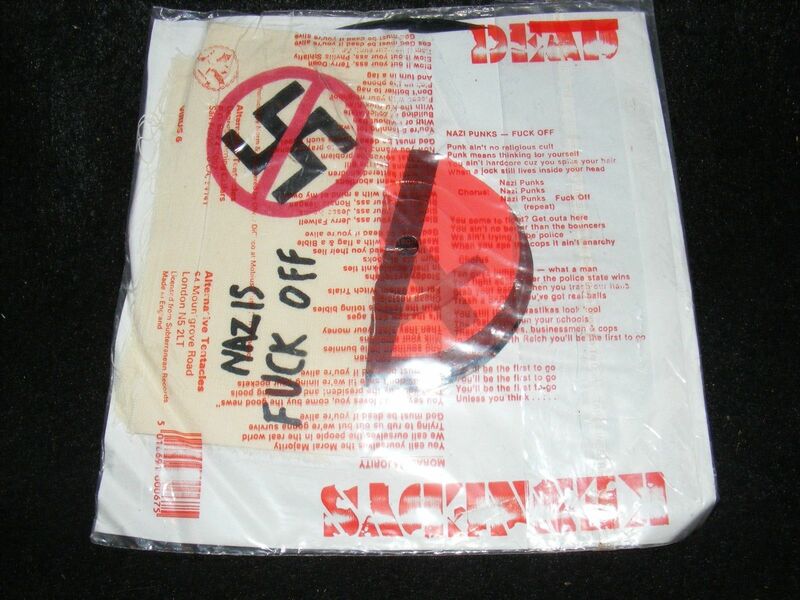 Still sealed in custom vinyl / poly printed Sleeve, from 1981... "DEAD KENNEDYS: Nazi Punks F**K OFF"
Original 7 inch 45 rpm single record... With original bonus printed "armband" insert visible through back plastic... Alternative Tentacles #VIRUS 6. "NAZI PUNKS F**K OFF" b/w "MORAL MAJORITY" I assume this is a never opened item.. The seal is tight, but it's POSSIBLE this was opened at one time... Some creasing/ wrinkling/ rubbing etc. to the outer plastic (see photos)... Condition of the sleeve; EX, Still sealed, see note above. Condition of the labels; SS. Condition of the playing surfaces; SS.